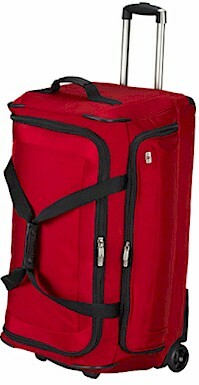 A two-compartment duffel on wheels. This duffel has a roomy main packing area that unzips to reveal an additional bottom compartment. The outside pocket adds to the large amount of storage. The removable internal rods provide structure and stability to the case, it also allows the bag to be collapsed for storage. On the Outside, thermoplastic corner guards protect the case. One touch, lightweight, 41" aluminum alloy handle with a comfort grip and top-quality 80mm in-line skate wheels provide easy handling and rolling. Never-Lost Attach-a-Bag strap tucks into front pocket and secures additional bags on the front. And TSA-certified combination locks secure belongings. All these features found through out Swiss Army's Mobilizer NXT 3.0 Collection. Comes in Red and Black. In the Inside, this piece has 2 compartments for packing. The outside pocket is great for toiletries and the inside pockets provide separation. All Swiss Army Luggage pricing includes Free domestic shipping and more. Also, no sales tax if shipped to anywhere outside the state of Michigan. On line ordering is of the highest level secure format. We have been in business for over 50 years and offer 30 day Money Back Guarantee. All Swiss Army pieces are backed by Manufacturer's Lifetime Warranty. We also can gold hot stamp your initials at no extra charge, just specify desired initials under "Special Instructions" when placing order.